In this book a big brother is jealous of all the attention and gifts his baby sister receives. He begins to wish he were the baby; and in this humorous tale of role reversal, he dreams that his wish comes true. Once he wakes up, however, he realizes how much he enjoys all the things he can do as an older child, and he begins to relish his big brother role. - Publisher The arrival of a new baby sister turns a little boy's life updside down. After jealousy watching the baby receive all the attention and all the gift's, he begins to wish that he could be the baby instead! I WISH I WAS THE BABY offers a wonderful opportunity to prepare young children for the changes that accompany the arrival of a new baby. About "I Wish I Was the Baby"
The arrival of a new baby sister turns a little boy's life updside down. After jealousy watching the baby receive all the attention and all the gift's, he begins to wish that he could be the baby instead! 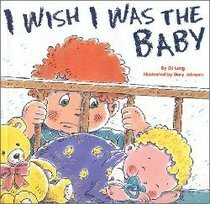 I WISH I WAS THE BABY offers a wonderful opportunity to prepare young children for the changes that accompany the arrival of a new baby.